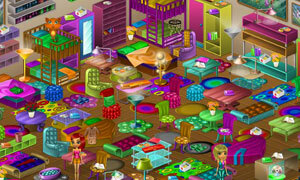 Shopping to Decorate is a another online hidden object game by dolodoli. It's time for some changes at the Doli house, and you are invited to help, so let's go Shopping to Decorate. The exterior is already great, because of Toto's House Design, but we still got a lot of work to do inside! So please help us find those hidden objects that we've been searching for, and let's start decorating! We trust you're going to do a great job, there's no doubt about it, so lighten up that room by adding some shiny furniture, bring some color to the decor, and make us feel comfortable in the room we'll be spending a lot of our time! Good luck and have fun.